Tooth hypersensitivity is a common dental problem. It is a sharp dental pain of short duration which arises from various triggers like thermal (hot and cold), evaporative, chemical, osmotic or electrical. It can develop over time, as a result of other problems like receding gums and enamel wear. People with age between 20 and 50 years are more likely affected by this problem. Gum recession: It is one of the leading causes of tooth sensitivity. Gum recession can be caused by frequent aggressive tooth brushing, by using a hard tooth brush, long standing gum disease and even aging. 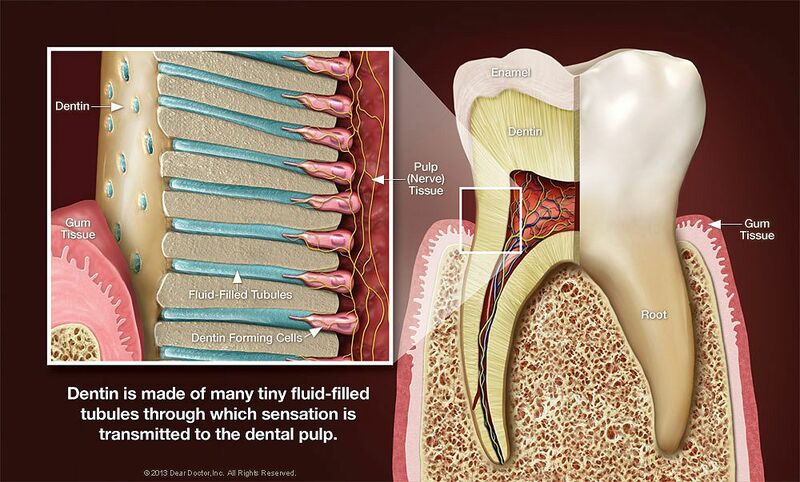 Gum recession exposes the root surface of tooth which is covered by a softer layer called cementum. This layer wears off easily with tooth brushing exposing the underlying dentin layer of the tooth. As dentin layer is traversed by thousand of channels from the outer surface toward the centre, external triggers can stimulate the nerves inside the tooth causing sharp sensation.